And then the world collapsed. The United States turned into a post-apocalyptic dystopian world, filled with bad teeth, too much leather, and evil marauders intent on no good. Ryan and his team were left without direction, in an abandoned facility in the middle of the New Mexico desert. Slowly but surely, everyone left, until only Ryan was left. That was, until the day that a gang of rotten toothed bandits came calling. 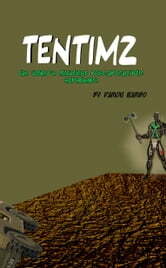 The ensuing events would lead to the creation of the World&apos;s Mightiest Post-Apocalyptic Super Hero....TENTIMZ!